A reader asked us this week if we could figure out how long people live in New York City before they start calling themselves New Yorkers. As a Brit (or to use the Census Bureau’s term, a member of the New York’s “foreign-born population”) who arrived in New York only five months ago, I don’t yet think of myself as one. That got me wondering (partly because I can’t find a survey that tackles the messy question of how New Yorkers think of themselves), how many other residents of the city were, like me, born abroad? A 2013 report by the Department of City Planning explains that 37.2 percent of New York’s residents are foreign-born. The data, which comes from the American Community Survey (ACS), also shows that those 3.1 million people represent 7.6 percent of all foreign-born residents in the United States. Is New York the most diverse city in the United States? If you define diversity as the share of residents who were born abroad (an admittedly crude definition), then the answer is no, according to the 2009 ACS. 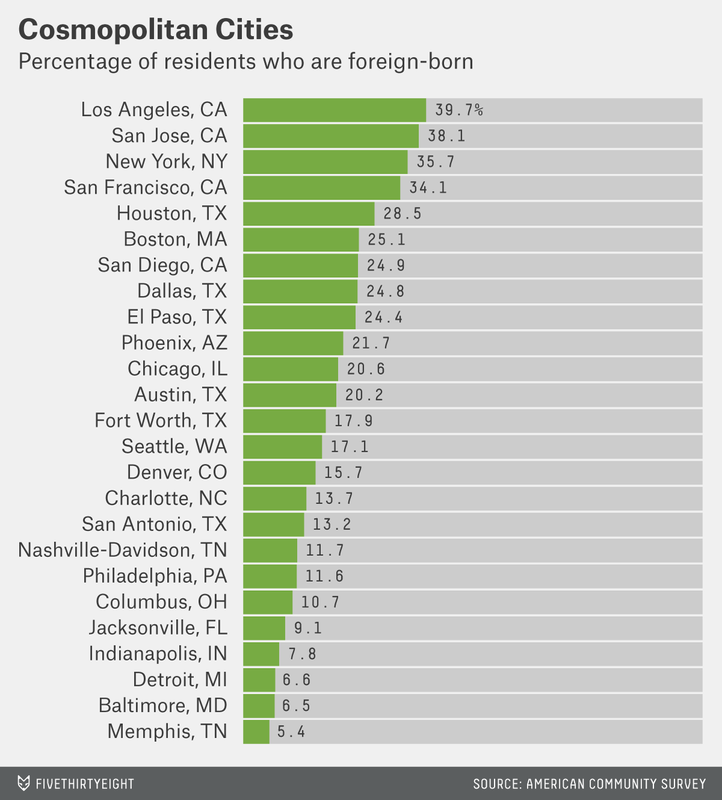 Of the 25 largest U.S. cities, New York ranks third, behind Los Angeles (where 39.7 percent of the population is foreign-born) and San Jose (38.1 percent). This leaves me with two questions: What percentage of New Yorkers were born in the city, and what percentage were born elsewhere in the United States? Those questions are tricky to answer because that data is readily comparable only at a state level. In 2010, the ACS recorded that 63.6 percent of people who lived in the state of New York were born there. On that basis, New York is nothing special: On average, 58 percent of residents of any given state were born there. 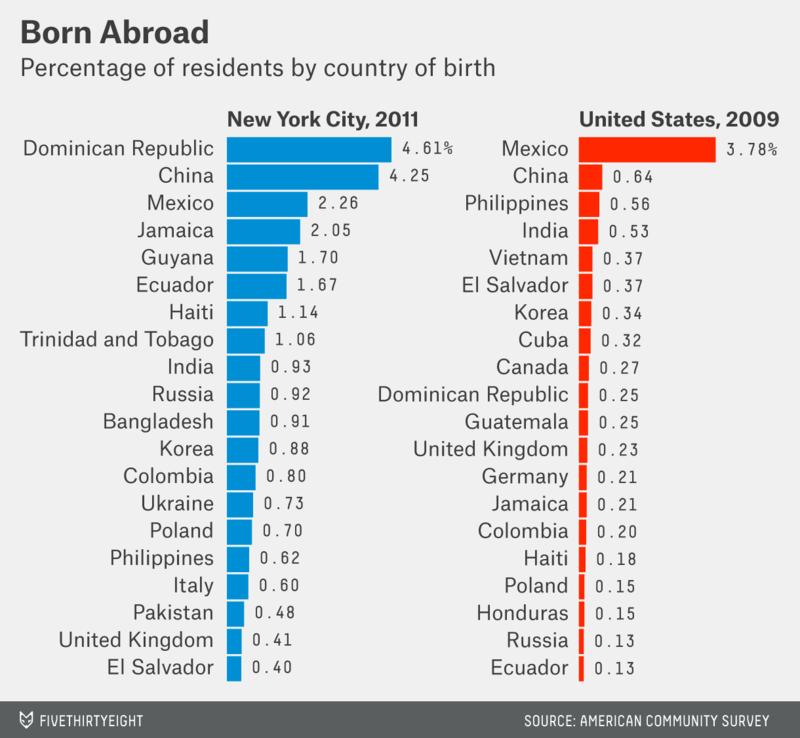 The ACS also found that, in 2010, only 11.8 percent of New York’s residents were born elsewhere in America. That means more New York residents were born abroad than in the 49 other states combined. In that regard, New York is something of an outlier. On average, 1 in 3 residents of any state are Americans who have migrated from elsewhere in the country. Only Puerto Rico had a smaller percentage of residents who were born in the U.S. but outside the territory — 5.1 percent.